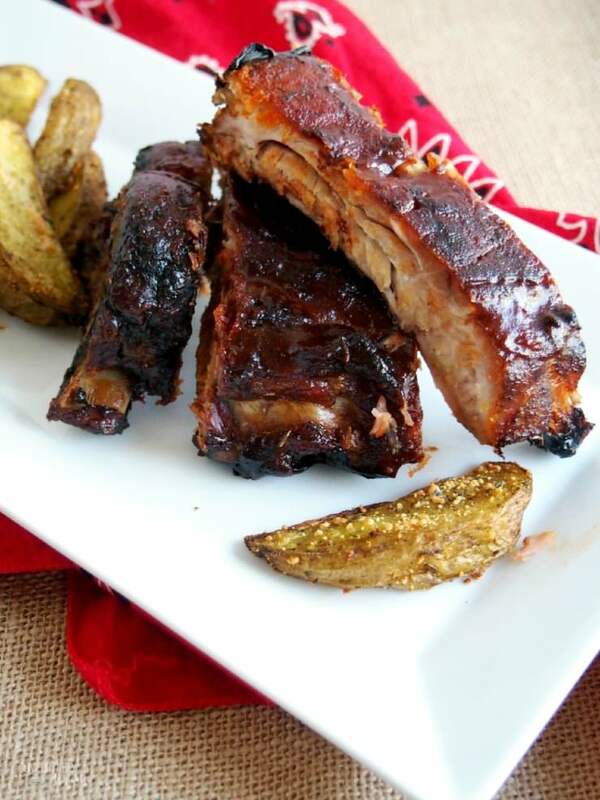 Perfect Barbecued Ribs are slow roasted until so tender that the meat falls right off the bone, then finished on the grill to caramelize that sweet and sticky barbecue sauce for ribs that are finger lickin’, lip smackin’ delicious! The weather here is absolutely beautiful which will make for the best barbecue weather around for the Memorial Day Weekend. Barbecue grills are going to be burning coals or kicking out propane like crazy this weekend. One of our favorite foods to cook on holiday weekends are fall-off-the-bone Perfect Barbecued Ribs. Baby back ribs, not country style, and don’t even talk to me about beef ribs. Just don’t. The distinction seems silly but it’s been a point of contention between Bonus Mom and I for years. Don’t get me wrong–we’ll both happily eat saucy ribs of any kind–but we have our own personal preferences when it comes to the cut of ribs. Bonus Mom prefers the thicker country style (a.k.a. St. Louis cut) ribs cut from the middle of the rib cage, while I prefer the baby back variety that are cut from closer to the spine. She thinks that her favorite is meatier and therefore better. I think that my favorite it more tender. She’s totally wrong, but whatever. I realize that barbecue is a sensitive subject for a lot of home cooks. Everyone seems to have their own tastes and way of doing things. Sauce/no sauce, rub/no rub, grill/smoker. I’ve heard that in some parts, barbecue recipes are guarded as heavily as the Holy Grail. People are really that serious about it. If you are a take-no-prisoners-Barbecue-Authority-type, I apologize in advance for anything you may read or see here today. Incidentally, did you know that there’s an actual barbecue camp in Texas? It’s like summer camp for barbecue nerds the serious barbecue aficionado. I’m not one that falls into that category, but I sure respect those who do. Rock on, Barbecue Nerds! I’m not too fussy about barbecue. I operate pretty simply with applying a good rub, letting it sit and get happy for awhile, then slow roasting in the oven before finishing it on the grill. Roasting the ribs on a low heat for a few hours is what makes the meat so tender that it literally falls off the bone when it comes time to eat them. Regardless of cut, ribs have a lot of less-than-tasty connective tissue that, when cooked quickly, will err on the tough and chewy side. I don’t know about you, but tough and chewy are two character traits that I do not want applied to barbecued ribs. A long, slow roasting in the oven breaks down those tissues slowly, tenderizing the meat as it magically melts away. The prolonged heat actually causes a physical and chemical change to the connective tissue called “denaturing” but “magic” sounds so much cooler. Another hot tip for perfect barbecued ribs is to remove the membrane on the back of the slab. That sucker never breaks down entirely and tends to be a little rubbery. Removing the membrane before coating both sides of the ribs with a good rib rub is just good policy. Just wiggle a little paring knife on the short end of the slab and start pulling to remove it in (hopefully) one long sheet. Once the ribs have been slow roasted until they are very nearly falling off the bone, remove them from the oven and baste with a really great barbecue sauce. 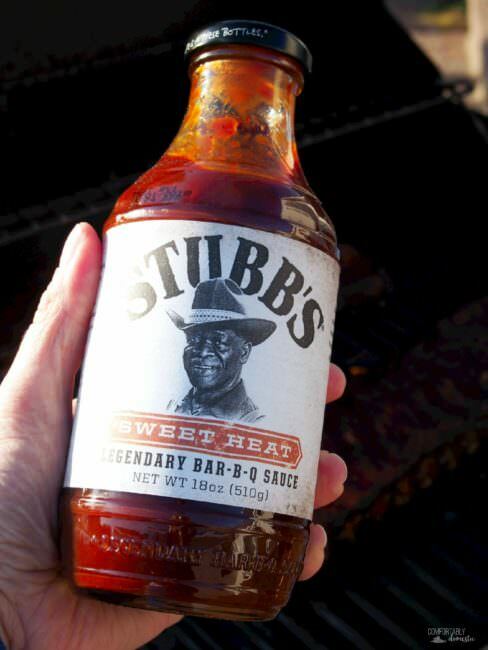 I have a recipe for homemade barbecue sauce from the days when this here blog was still a newborn but 9 times out of 10, I grab a bottle of Stubb’s “Sweet Heat” Legendary Bar-B-Q Sauce. I like Stubb’s barbecue sauces because they’re all natural, made with real sugar, and the flavor is out-of-this-world delicious. The Sweet Heat variety is my favorite because it has a touch of heat on the flip side to temper the sweet and sticky sauce. The folks at Stubb’s don’t pay me to say it. I just love their stuff. 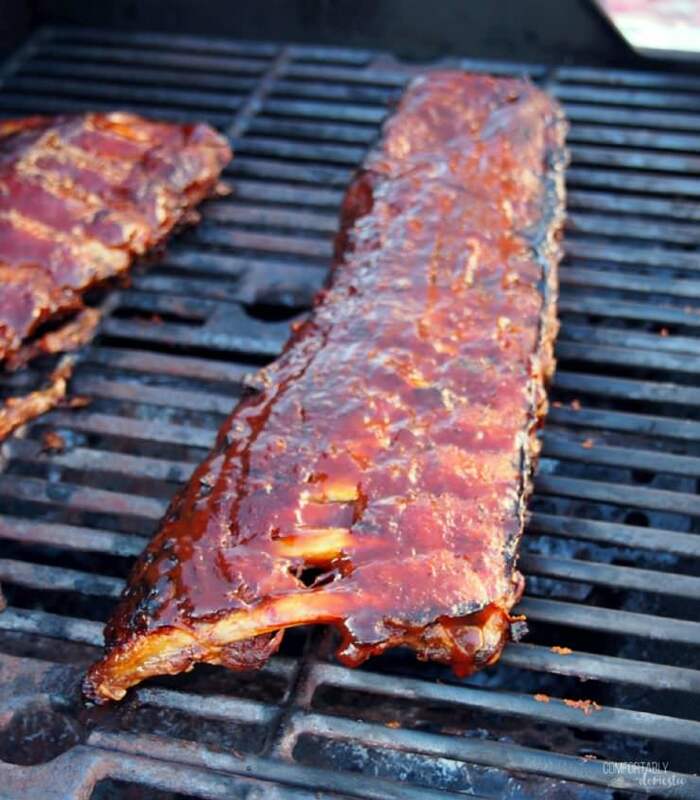 Once the ribs have been lightly sauced on the curled side, grill the racks upside down over medium heat for 3 to 4 minutes to caramelize the sugars in the sauce. Flip the ribs to expose the topside of the slab and slather sauce on upside of the slab. 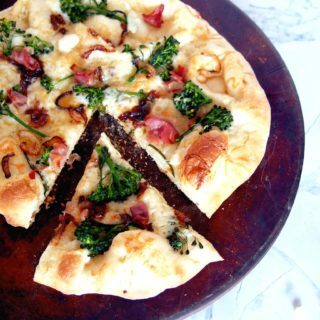 Continue to grill for another 3-4 minutes to caramelize the top. Ready for my #1 Barbecue Tip of All Time? Never walk away from the grill! Fire has a habit of flaring up to lick that sweet barbecue sauce right off the ribs, causing it to burn. Keep diligent watch to move the slab around and temper those pesky flame ups, as necessary. 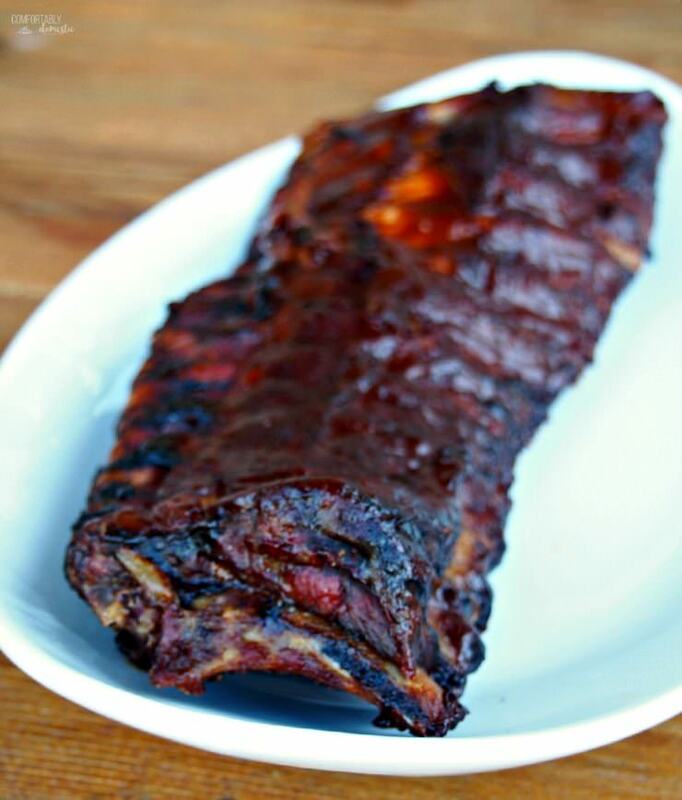 Perfect Barbecued Ribs will be so tender that the meat literally falls right off the bone. This makes for ribs that are finger lickin’, lip smackin’ delicious! If you’re feeling extra saucy, serve Perfect Barbecued Ribs with additional barbecue sauce on the side for dipping. I highly recommend whipping up a batch of Baked Potato Wedges to soak up any extra barbecue sauce on the plate. Lined a rimmed half sheet pan with heavy duty aluminum foil; briefly set it aside. Rinse the baby back ribs then pat dry with paper towels. 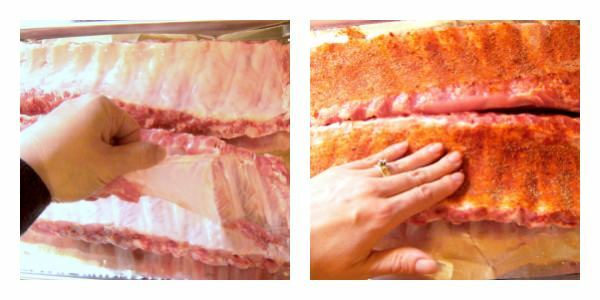 Trim the excess fat from the top of the ribs, being careful not to cut through to the bone. Flip the ribs over to expose the underside so that the bones appear to be curling upward. With a sharp knife, gently loosen the white membrane on one end of the back of the bones. Once an “edge” of the membrane is loosened, firmly grasp the membrane and pull it across the bones to remove it. The membrane should come off in one large sheet. Sprinkle half of the rib rub onto both sides of one slab of ribs, rubbing it in well so that it adheres to both sides. Repeat with the other half of the spice rub and second slab of ribs. Place the ribs onto the prepared sheet pan and cover with plastic wrap. Chill in the refrigerator for at least 1 hour or up to overnight. When ready to cook the ribs, preheat the oven to 300 degrees F.
Slow roast the ribs, curled side up, for 90 minutes. Turn the ribs over with long kitchen tongs so that curled side is down. Slow roast the ribs for an additional hour or until tender. When gently lifting a loose bone on the end of the slab, the bone should want to pull apart from the rest of the slab. Preheat the grill to medium high heat. If using a charcoal grill, begin preparing the coals 30 minutes prior to removing the ribs from the oven. Place the ribs on the grill, curl side up, basting the curl side with barbecue sauce. Grill the ribs for 3 to 4 minutes or until the sauce begins to dry and caramelize. Turn the ribs over and baste the topside of the ribs with more barbecue sauce. Continue to grill for 3 to 4 minutes or until the sauce begins to caramelize. Be sure to continuously watch the ribs on the grill to avoid “hot spots” and flare ups that can burn the barbecue sauce. Transfer the ribs to a large, heat proof cutting board and tent with aluminum foil. Let stand 10 minutes before cutting to serve. No grill? No problem! 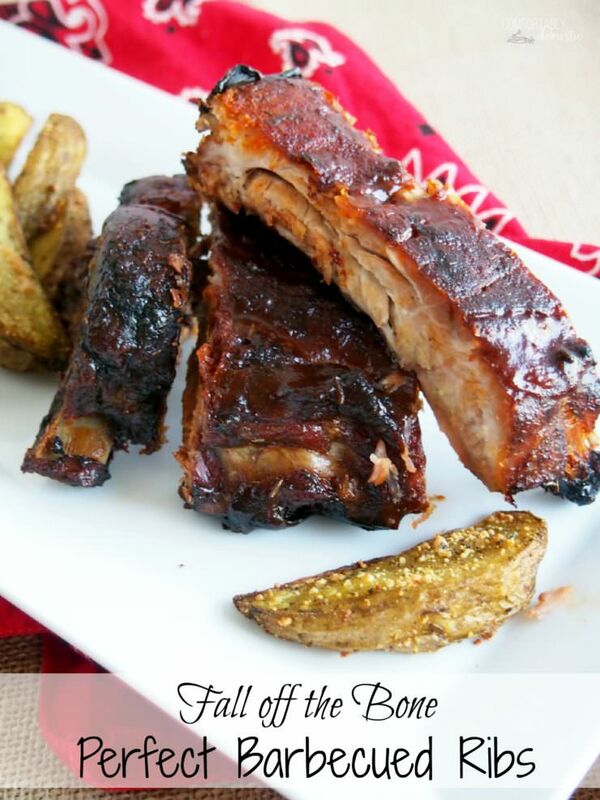 I have a recipe for sweet and tender barbecued ribs made in the oven from back when my blog was a newborn babe. The photos leave a little to be desired, but the method is sound. I’ve adjusted my rib rub since then, and I use Stubb’s Barbecue Sauce instead of my homemade sauce 90% of the time because I’m just that practical. This is not a sponsored post. I truly love Stubb’s products because they use all natural, minimal ingredients in their recipes. Ok, don't hate me BUT I love St. Louis ribs...haha. I mean I'll take ribs in ANY form but I'm on team "I want the most meat out of my cut of meat." I really love Stubb's BBQ sauce so I know I would go crazy over these babies. "She's totally wrong, but whatever" is both hilarious and completely accurate. #BabyBacksOrBust PS: TCP is so stinkin' proud of you right now. I knew you'd be with me on the rib front. Not gonna lie...TCP's endorsement makes me proud. That man knows his barbecue! I am LOVING this weather and have been grilling out every night. 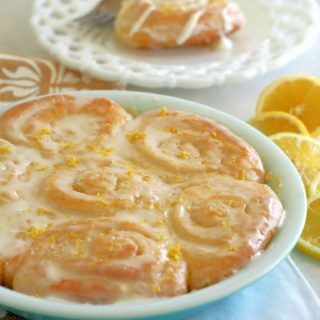 Love this new idea to try!